Widely regarded as one of the leading cosmetic and facial plastics surgeons nationally, you're in phenomenal hands with Dr. Ronald Moy. As one of the leading cosmetic and facial plastics surgeons in Los Angeles, Dr. Moy is also a Diplomate of the American Board of Dermatology and American College of Mohs Surgery. He specializes in Cosmetic and Facial Plastic surgery, face lifts, liposuction, laser skin resurfacing, eye lifts and Mohs Micrographic Surgery. 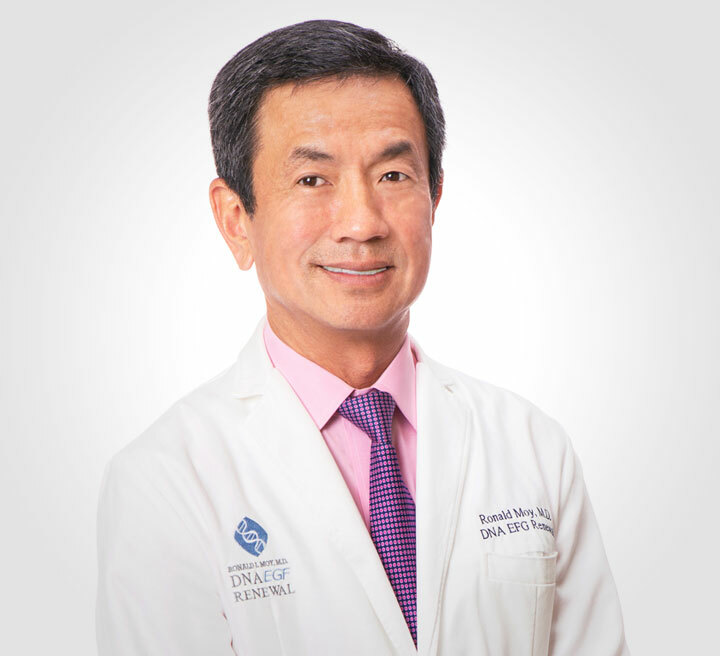 Dr. Moy is also a diplomate of the American Board of Dermatology and the American Board of Cosmetic Surgery, a member of the American Academy of Facial Plastic Surgery and has published more than 200 scholarly articles. He has performed over 30,000 cases of Mohs Micrographic Surgery and facial plastic surgery over the past 25 years of clinical practice. Dr. Moy’s medical background and accomplishments include completing his dermatology residency training at UCLA. Dr. Moy then completed his Facial Cosmetic and Mohs Micrographic Surgery Fellowship training at the University of Pittsburgh Center for Health Services. He has also been professor at the David Geffen School of Medicine at UCLA, is a former Co-Chief of the UCLA division of Dermatology, is a former Chief of Dermatologic Surgery. He has served on the Editorial Board of the Archives of Facial Plastic Surgery, is a former president of Los Angeles County Medical Association, Bay District and is past Editor-in-Chief of the Dermatologic Surgery Journal. He is currently on the Editorial Board of Archives of Facial Plastic Surgery and Aesthetic Surgery. He also volunteers his dermatologic services at the Venice Family Clinic for the past 20 years. Dr. Moy is also a published author of more than 200 articles on cosmetic and dermatologic surgery and treatments and is a renowned international lecturer on advancing cosmetic surgery technologies. Q: What inspired you to become a dermatologist? A: I was inspired to help people with skin problems using scientific research, which is why I have written over 200 scientific research publications and continue to perform research. Q: Why did you decide to practice dermatology in Beverly Hills? A: Moy, Fincher, Chipps Facial Plastics and Dermatology is located in Beverly Hills because all our team members are longtime residents of the area and active in the community. Prior to being located in Beverly Hills, our dermatology practice was at the UCLA Medical Plaza in a smaller space. We moved to Beverly Hills to a larger office that would offer the space needed to provided the best dermatology care available to our beloved patients. The Beverly Hills office has allowed us to use all our dermatology lasers and technology and have a surgical center within a large, pleasant office space. A: I specialize in facial plastic surgery, facial cosmetic surgery, Mohs Micrographic Surgery and anti-aging medicine with bio-identical hormone replacement. Q: What makes Moy, Fincher, Chipps Facial Plastics and Dermatology the leading dermatology practice in Beverly Hills? A: The reason that Moy, Fincher, Chipps Facial Plastics and Dermatology is the leading dermatology practice in Beverly Hills is that we have all the best technology to tighten skin and resurface skin, and the skills and expertise to help patients achieve their goals. The latest technology allows many patients to avoid surgical procedures. Our expertise in surgical procedures is based on having written textbooks and articles on neck lifts, facelifts, eye lifts and skin resurfacing underline local anesthesia. A: The piece of skincare advice that I frequently offer is that we can now repair past DNA damage with DNA repair creams and oral Vitamin B3 compared to only preventing future DNA skin damage with sunscreen and hats. A: My approach to providing patient is to treat all patients like my family. I give everyone my email and any surgical patient my cell phone. I encourage questions. I give everyone my best and honest advice and want to help everyone I can. I keep everyone looking natural. I became a physician to help people. Q: What is one of your favorite things to do in Beverly Hills? A: I love eating outside at one of our local Italian restaurants with my wife of 32 years, our daughters and our dog, Napoleon.